﻿ Holiday houses with electric car charging points. Looking for electric car or plug-in hybrid charging points at a holiday house? Going on holiday in your electric car or plug-in hybrid? 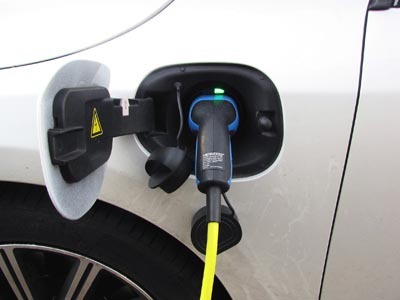 Electric vehicles, are commonly known as EVs - soon many holiday cottages and houses will be installing charging points as these vehicles are becoming increasingly popular in the UK. Be sure that if the holiday cottage you rent does not have its own EV charging point (some self-catering holiday homes do have dedicated charging units for ultra low emission vehicles (ULEV)) that there are public charging points in convenient locations close by. Motorway service stations and supermarkets across UK are rapidly installing them. Some National Parks are encouraging holiday makers to use electric vehicles and many businesses across the National Parks and visitor attractions have facilities for recharging. When on holiday many National Trust properties have charging points close by - you can see a list Charge your car at a National Trust property. Electricity list all their charging points on a convenient app - essential for holiday makers travelling in electric or plug-in hybrid cars. View electric charging points in UK If you are on a short break in rural England, you need to be prepared. Large holiday house owners should consider installing a re-charging point. Our advice to holiday home owners is to install an electric vehicle charging point as you will attract more guests, use a certified installer and approved charging products and don't forget to tell your insurance company. An overnight charge on a holiday house driveway is highly desirable to an EV owner. Big house in North Yorkshire near Scarborough with 7 bedroom, sleeps 14, Pets friendly, Pub within 1 mile, Wifi, Cot Available, Coastal Property. Large rental property in Gwynedd near Blaenau Ffestiniog with 7 bedroom, sleeps 15, Pets friendly, Barbecue, Cot Available. Luxury accommodation in Norfolk near Horning with 5 bedroom, sleeps 12, Pets friendly, Ground Floor Facilities, Wifi, Cot Available, All En-suite, Private Hot Tub. Exceptional holiday cottage in Cumbria near Pooley Bridge and Northern Ullswater with 8 bedroom, sleeps 16, Pets friendly, Barbecue, Pub within 1 mile, Wifi, Cot Available.